If you didn't realise from my giddiness in my Hotel Chocolat post, I love Halloween! When else do you get to be crafty and creative, dress up like a big kid, and party? 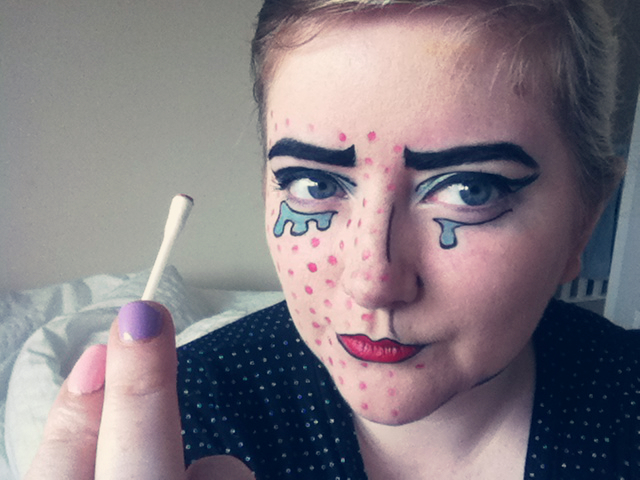 So this year in the run up to October 31st I'm going to run a series of make up tutorials for different Halloween looks, starting with a Lichtenstein inspired piece. You'll want to start with an even base.. I just used a pale foundation all over my face. Step 1. 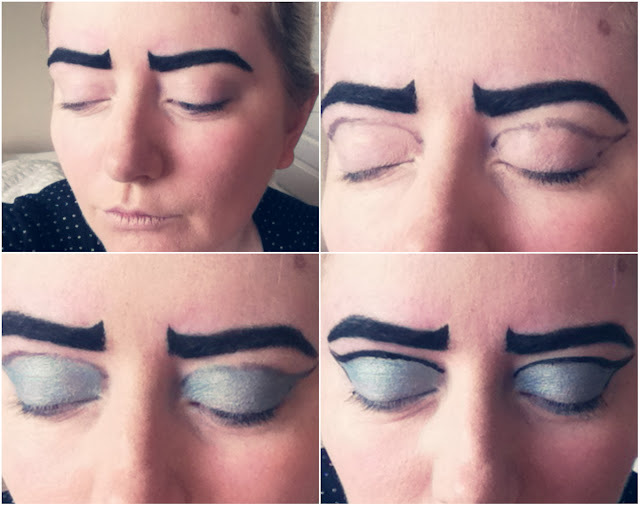 Draw on the ultimate scouse brows! I used a black eyeliner pencil to fill mine in and roughly create the shape I wanted, then went round the edges with a liquid eyeliner. Try to keep your lines as crisp as possible. Step 2. Using a kohl eye pencil, sketch the lines at the top of your eyelids. You'll want to see this line when your eyes are open, so use the pencil lightly at first until you are happy with the position. Step 3. Fill your lids with a coloured eyeshadow (mine was from an Urban Decay palette). Try and build the colour as much as possible, this isn't a subtle look! Step 4. Very carefully, use liquid eyeliner to paint over the pencil lines. Use small strokes at first so your hands don't wobble too much! Better to make the line a bit thin at first, it's easier to build it up than vice versa! I also added eyeliner along my lash line at this stage. Step 5. Draw lines underneath each eye (lightly in pencil first, then go over with liquid eyeliner), and add tears to each side. I again used pencil to sketch out their position, then coloured them in with a blue eyeliner pencil (why on earth do I own blue eyeliner? At least it came in handy here!). Step 6. Liquid eyeliner again! This time, outline the tears (a wee bit tricky as they are curvy shapes, just go slowly), and start adding lines to your face. I did a line down the side of my nose, round my nostrils and above my lip. Use either liquid eyeliner or a sharp kohl pencil for this. Step 7. Draw a line around your jaw. I wish I had continued the line around my forehead too, so you should do this! Step 8. Put on bright red lipstick and outline your lips with liquid eyeliner. 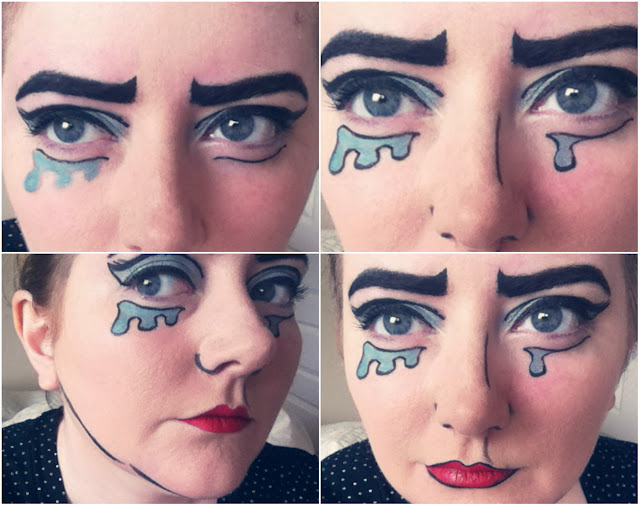 I have to admit I found this bit SO fiddly, it took me quite a few attempts, and I don't think my final look is particularly even! Again, just do small strokes with the brush, it's much easier than trying to paint one smooth line. Step 9. The most fun bit! 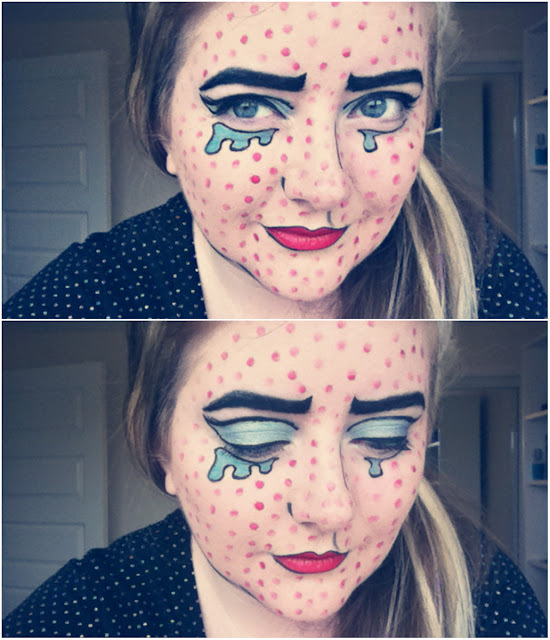 Ideally you would use a red lipliner for this, but I didn't have one. Instead I used a cotton bud and red lipstick. Dip it into the colour, and twirl for an even(ish) dot of colour on your face. I tried to work in even lines. And that's it! Style with polka dot clothes and a brightly coloured wig! & please remember to continue the dots down your neck... 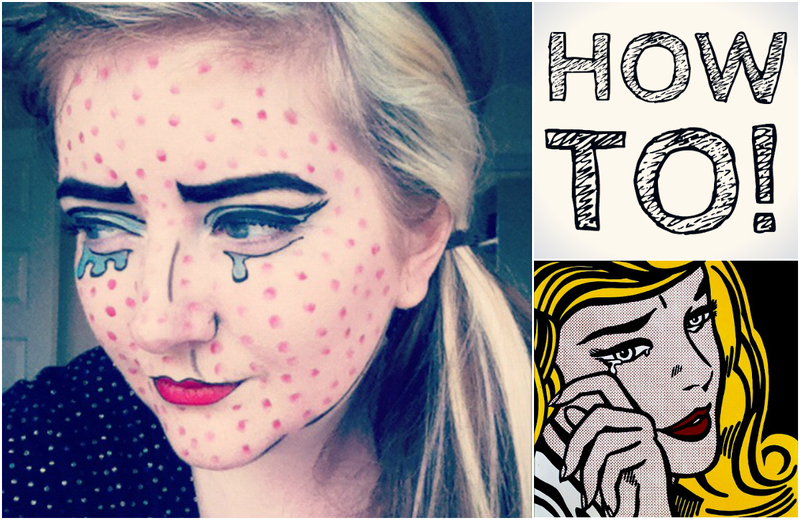 I forgot to do it & you'll look so much more complete (and less like you just have measles). You can even do polka dot nail art to match! Such a fun post! I love Halloween too! Fancy A Peek? ?Check out My Blog! this looks so awesome!!! i would love to do this for halloween one year!! Aw wow, it looks so cool, AH MAZE ING!